Note to editors: There are 4 figures/maps associated with this press release. OPUS ONE Resources Inc. (the "Company" or "OPUS ONE") (TSX VENTURE:OOR), is pleased to announce the discovery of a new gold showing during the summer trenching program on Fecteau property in the Urban-Barry Greenstone Belt. The new showing contains an east-west quartz vein hosted in a plurimetric altered and sheared quartz porphyry (QP) unit. Mechanical stripping was carried out over a sub-cropping area discovered by prospecting last July. Over 38 metres of strike length was stripped and sampled. The structure remains open in all directions as the overburden thickness increases at both ends of the showing. The vein varied in width from 2 to over 3 metres and is surrounded by a 1 to 2 metres zone of silicification and quartz stockwork. The vein contains quartz and carbonate with minor tourmaline and up to 5% pyrite. 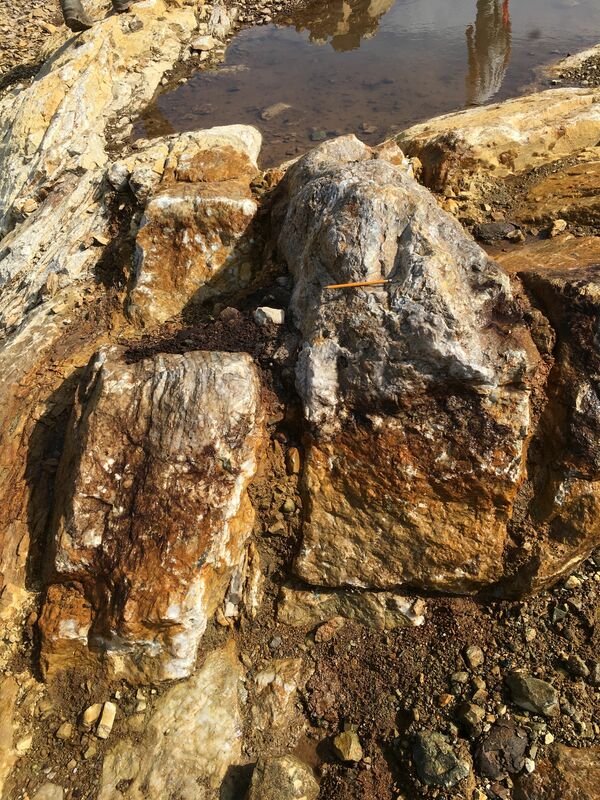 The surrounding quartz stockwork also contain 1-3% pyrite and is strongly anomalous in gold. The vein strikes east-west and dips to the north at 52 degrees. The QP which host's the quartz vein is strongly sheared and altered (mostly silica and sericite). Historical drill holes LF-12-03 and LF-12-02 (1.93 g/t Au over 0.6m and 1.20g/t Au over 1.0m associated with disseminated sulfides) are located at 400 and 500m east of this new showing. 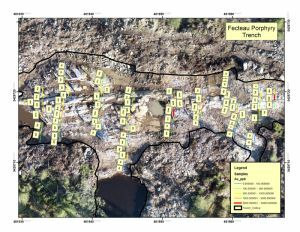 A table with complete assay results, location map, detailed trench map and photos can be found at the link indicated at the end of the release. Follow up diamond drilling is planned for the next exploration phase during winter 2018. In parallel, a geophysical compilation and re-interpretation over the entire property are in progress and planned to be delivered next January. Mr. Louis Morin, CEO, states: "This new exciting discovery on Fecteau property is an example of the potential for successful exploration in this developing mining camp. 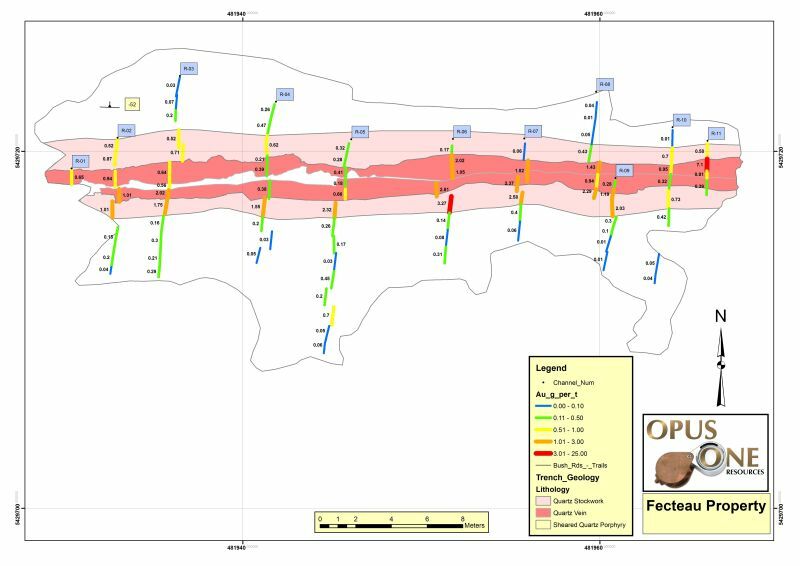 We were already aware of the potential for gold rich VMS/Bousquet type deposit in this particular area of the Urban-Barry greenstone belt, but having coherent gold grades in association with quartz veins inside a Quartz Porphyry bring us a new vision of the possibilities for Fecteau. We look forward for our next winter's drill program to explore this new zone as well as other high priority targets." Fecteau is a gold property which consists of 90 mining claims covering an area of 5,078 hectares located in the highly prospective Urban-Barry greenstone belt, 30 kilometers east of the Osisko Mining Windfall Lake and Lynx projects. The property is easily accessible via a good network of logging roads. The area is underlain by rocks of Archean age of the Fecteau formation. The property contains 8 historical gold and base metals (Cu and Zn) occurrences with gold grades varying from 1 g/t to up to 8 g/t and was mainly explored for base metal deposits in the past. The property is surrounded by Osisko Mining claims. Samples collected during the 2017 fall exploration program were dispatched from Chapais to Laboratoire Expert, Rouyn-Noranda for processing. Standard and blank QA-QC samples were introduced in the sample series at regular intervals in the field. All samples were processed according to Laboratoire Expert's internal quality control procedures. They were analysed following standard pyro-analyses technics "Fire Assay-Atomic Absorption". Samples which returned values equal or greater than 5.0 g/t were reanalysed by gravimetric method. Opus One Resources Inc. is a mining exploration company focused on discovering high quality gold and base metals deposits within strategically located properties in proven mining camps, sometimes close to existing mines in the Abitibi Greenstone Belt, north-western Quebec and north-eastern Ontario - one of the most prolific gold mining areas in the world. 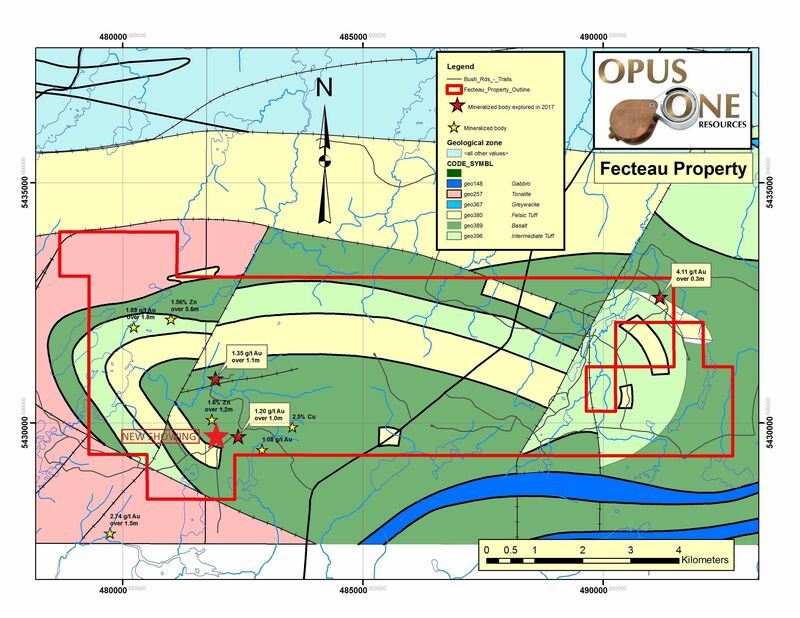 Opus One holds assets in Val-d'Or, Matagami and Chibougamau areas. Bachelor Extension property is adjacent to Metanor Resources Inc.- Bachelor Gold Mine, Vezza Extension and Vezza North are located few kilometers West and North of Nottaway Resources Vezza Mine. Courvillle property is located east of Val D'Or. 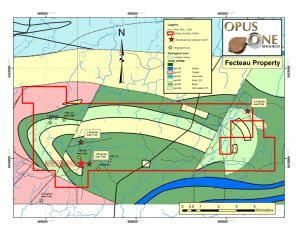 In addition, Opus One has also optioned three properties, all easily accessible by a network of all season roads: Fecteau property, located in the Urban-Barry greenstone belt, east of Osisko Mining's Windfall Lake deposit, currently one of the most active exploration area in Canada; Winwin property, located directly North of Iamgold's Monster Lake property, and the Grizzly property, located 40 kilometers north-west of the city of Chapais in a similar geological setting to Northern Superior's Croteau East project. Tony Brisson, P. Geo and director of Opus One, acts as a Qualified Person as defined in National Instrument 43-101 and has reviewed and approved the technical information in this press release. This news release contains statements that may constitute "forward-looking information" within the meaning of applicable Canadian securities legislation. Forward-looking information may include, among others, statements regarding the future plans, costs, objectives or performance of OPUS ONE, or the assumptions underlying any of the foregoing. In this news release, words such as "may", "would", "could", "will", "likely", "believe", "expect", "anticipate", "intend", "plan", "estimate" and similar words and the negative form thereof are used to identify forward-looking statements. Forward-looking statements should not be read as guarantees of future performance or results, and will not necessarily be accurate indications of whether, or the times at or by which, such future performance will be achieved. No assurance can be given that any events anticipated by the forward-looking information will transpire or occur, including the development of the Grizzly Property, or if any of them do so, what benefits OPUS ONE will derive. Forward-looking information are based on information available at the time and/or management's good-faith belief with respect to future events and are subject to known or unknown risks, uncertainties, assumptions and other unpredictable factors, many of which are beyond OPUS ONE Resources Inc.' control. These risks, uncertainties and assumptions include, but are not limited to, those described under "Risk Factors" in OPUS ONE's management discussion and analysis for the year ended August 31, 2016, a copy of which is available on SEDAR at www.sedar.com, and could cause actual events or results to differ materially from those projected in any forward-looking statements. OPUS ONE does not intend, nor does OPUS ONE undertake any obligation, to update or revise any forward-looking information contained in this news release to reflect subsequent information, events or circumstances or otherwise, except if required by applicable laws. About this company Opus One Resources Inc.